If using charcoal grill, place drip pan directly under grilling area, and arrange coals around edge of firebox. Heat coals or gas grill for indirect heat. Fold wings of chicken across back with tips touching. Brush outside of chicken with oil. Sprinkle fajita seasoning mix inside cavity and over outside of chicken; rub with fingers. Pour 1/2 cup (125 mL) of beer from can. Hold chicken upright, with opening of body cavity down; insert beer can into cavity. 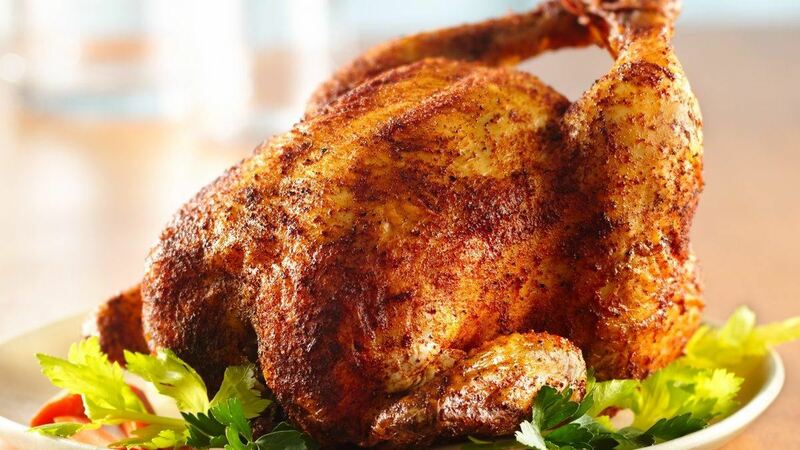 Cover and grill chicken upright over drip pan or over unheated side of gas grill over medium heat 1 hour 15 minutes to 1 hour 30 minutes or until thermometer reads 180°F (82°C) and juice is no longer pink when center of thigh is cut. Using tongs, carefully lift chicken and place in 9x13-inch (23x33 cm) rectangular baking pan, holding large metal spatula under beer can for support. Let stand 15 minutes before carving. Remove beer can; discard. Kitchen Tip: Use a 355 mL can of lemon-lime soda pop or ginger ale instead of the beer. The flavour will be slightly different, but the chicken will be tender and juicy. BBQ Chicken Pizza - on the grill!